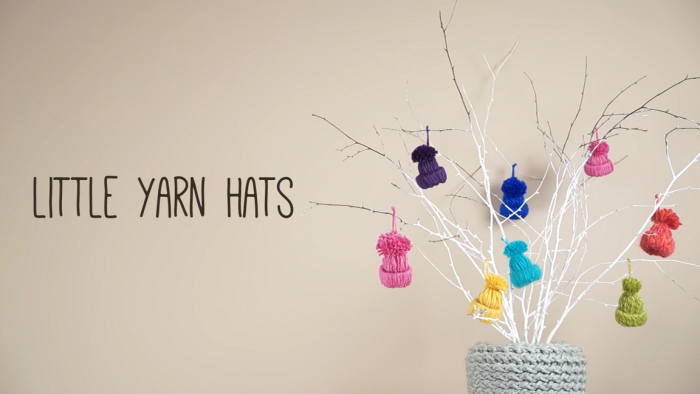 Let’s learn how to make this cute little yarn hat ornament, using a step by step DIY tutorial. I love and enjoy making my own Christmas ornaments, each year adding more and more unique designs to my collection and this alluring yarn hat ornament is definitely one of them. Last year, right before Christmas my daughter brought home one of these yarn hat ornaments that she’d made in school. I was absolutely charmed by this lovely project. I think it has to be one of the cutest homemade ornaments I have ever seen and that’s why I’m going to make more of these cuties this Christmas. So, if you were looking for the cutest DIY Christmas ornament ever, you just have to give these little yarn hat ornaments a go. Just follow the step by step tutorials and make a great gift for you friends and family members. Good luck and happy crafting. If you’re still looking for ideas of Christmas tree decorations, you should check this out!